If you already have a concrete patio but it is cold, austere and needs a facelift, we can rejuvenate it with a concrete overlay that complements the architecture and color palette of your residential or commercial structure. In fact, we can elevate the appearance of the entrance to your home or business with dramatic finishes and textures on your concrete steps and concrete stairs that blend beautifully with the colors and patterns of your building. 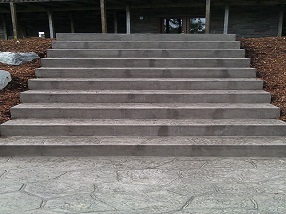 Why choose concrete steps, concrete stairs, patios, driveways or even sports courts? 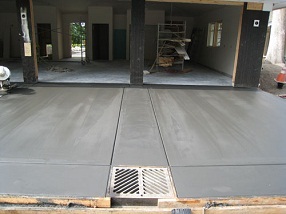 Call us if you are considering a new concrete installation or upgrade in the Lakewood area. Our team of concrete contractors is licensed, bonded and skilled at handling any type of concrete project. In cases where image or appearance is involved, everything counts! In fact, on average we make a judgment within four seconds. As a concrete construction company, we believe the entrance to your home or business should be warm and inviting. We are experts at creating not only the visual, but the structural elements such as concrete steps and concrete stairs with added architectural accent. We can provide additional services for concrete flat work including a creative concrete patio with a surface imitating nearly any material. Call us for estimates in the Lakewood area for concrete flat work such as a driveway, a concrete patio and even sports courts! Concrete flat work is an excellent choice for outdoor installations because of its durability and versatility. The material of choice for many home and business structural purposes is concrete, whether it is a new construction installation or a restoration of concrete stairs, concrete steps, or a concrete patio. 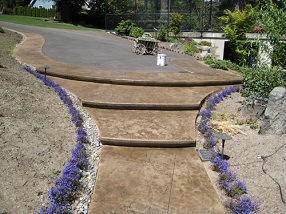 If you are considering a concrete walkway installation, concrete steps or stairs can be poured simultaneously to match your walkway color and texture.